(Bloomberg) -- After powering Hong Kong’s equity benchmark into a bull market, Tencent Holdings Ltd. stood out as the bright spot in the city on Thursday. The Internet giant rose as much as 3 percent, briefly trading above HK$400 for the first time in 10 months, after winning regulatory approval for one of its mobile games in China. It was the top performer and one of only three gainers on the Hang Seng Index, which closed down 0.9 percent. The shares are close to HK$405 -- the price at which a major shareholder cut its stake last year and triggered a wave of selling in the stock. Sentiment over Tencent had been improving after its first licenses to operate new games in China, and amid optimism over new businesses. The rally has seen the stock outperform the Hang Seng Index by the most since July and leaves it just 5.5 percent short of the average analyst price target. After plunging 23 percent last year on a run of bad news including a rare profit decline and a regulatory crackdown on gaming, brokerages had trimmed their 12-month price forecasts. 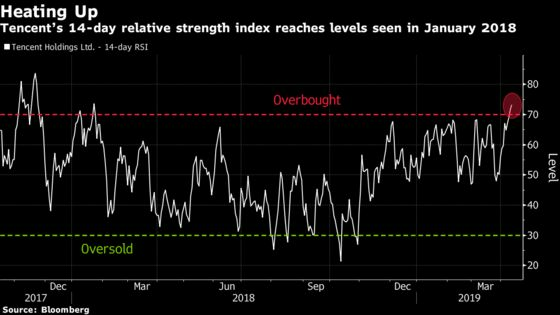 Tencent’s 55 percent rally since an October low has pushed its 14-day relative strength index to the highest since January 2018 and above the 70 level that may indicate it’s overbought.